Cairns has plenty to offer for people of all ages. So come on in and check out the best collection of web packages all in one place, right here at Mad About Sports. 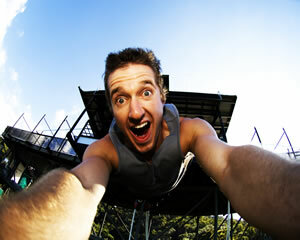 The Great Barrier Reef provides the backdrop for this exhilarating tandem skydiving experience over Cairns. Includes free transfers, full training, all equipment, 14,000ft tandem skydive and jump certificate. Experience a 7 day camping safari from Cairns to Cape York. Includes, Cooktown, Lakefield National Park, Musgrave, Weipa, Fruitbat Falls, Thursday Island, The Top, flight between Cairns and Horn Island. All meals as per itinerary. Experience a 9 day camping safari from Cairns to Cape York. Highlights include: Cape Tribulation, Cooktown, Lakefield National Park, Iron Range National Park, Weipa, Twin Falls, Thursday Island, The Top, flight from Cairns to Thursday Island. All meals as per itinerary. The Great Barrier Reef provides the backdrop for this exhilarating tandem skydiving experience over Cairns. Includes free transfers, full training, all equipment, 9000ft tandem skydive and jump certificate. Be transported into a world beyond your imagination so relaxing and uplifting for your soul you will never want to leave. A completely intimate, natural experience without compromising on comfort or safety. Ten minutes from Port Douglas, 50 minutes from Cairns and a world away from the everyday. A day of sightseeing with Food Trail Tours explores the varied landscapes and what local food & wine producers offer. Your day, full of tastings, includes tropical fruit wines, macadamia and coffee plantations, as well as a cheese factory and a hint of chocolate. Gray Line's exclusive Best of Cairns tour exemplifies the character of Far North Queensland. The highlights of Cairns, tropical gardens, beach resorts, crocodiles, kagaroos and "true blue" Outback Aussies. Departing daily from Port Douglas we explore one of the last true remaining rainforest wilderness areas. Discover the timeless Bloomfield River Falls which can only be discovered after a 33km 4WD trip via the Bloomfield Track. Also servicing Turtle Cove & Thala Beach Be met by your driver in the arrivals hall at Cairns Airport with your name on a sign board and transferred to your accommodation reception in air-conditioned comfort. Also servicing Yorkeys Knob, Trinity Beach, Kewarra Beach and Clifton Beach. Be welcomed by our driver in the arrivals hall with your name on a sign board and transferred to your accommodation reception in air-conditioned comfort. A great fun night out! Includes fantastic Aussie BBQ dinner, with beer and wine. Join the spotlighting tour, to meet the creatures of the night. ( owls, crocs, bandicoots etc). Cuddle a Koala (extra cost),have billy tea and damper with the kangaroos and dance with the good old Aussie Bush Band. Air-conditioned coach transfers from your accommodation to DFO Direct Facory Outlets + Cairns Candle Factory + Wholesale Seafood Market and return. See Cairns at its best - on a sunset cruise! Enjoy a glass of bubbly or a beer as you literally sail off into the sunset. The exotic scenery, the colours, the sounds - Trinity Inlet is heaven at dusk. This award-winning tour operator aims to please. 90 mins and nibbles - there's no reason to resist! What better way to start your evening than with a sunset cruise aboard our modern, air-conditioned 14 metre catamaran. Relax and take in the peacefulness of the Trinity Inlet as the sun sets for the day. A great way to see the Cairns CBD come to life for the evening with its city sparkling lights. Cape Tribulation & Bloomfield Falls await you! Day trip some of Australia's most spectacular regions in this varied tour. Relax in gorgeous fresh waters, be guided through serene rainforest and learn as you go! Spend a day seeing Cape Tribulation & Bloomfield Falls how they should be seen. Join us for a small, personalised tour to "where the rainforest meets the reef." Journey to the Wildlife Habitat and the Mossman Gorge. Enjoy a tropical buffet lunch, explore Cape Tribulation Beach and cruise the Daintree River. Enjoy a full day tour including lunch in the beautiful Cape Tribulation. Highlights include a Daintree River cruise, Cable Ferry Crossing the Daintree River, a refreshing swim at Mossman Gorge and much more! We depart daily from Port Douglas to explore one of the last true remaining rainforest wilderness areas. Discover a timeless world of splendour, with birds, butterflies and amazing lowland rainforest areas in the World Heritage Daintree and Cape Tribulation. Locally owned and operated our safari departs daily from Port Douglas to explore one of the last true remaining rainforest wilderness areas. Discover a timeless world of splendour, with birds, butterflies and amazing lowland rainforest areas in the World Heritage Daintree and Cape Tribulation. Join us for a tag along tour from Cairns to Australia's most northerly point, Cape York. In the comfort of your own vehicle our expert guides will help you negotiate the challenging tracks as well as showing you some amazing scenery along the way. If you are into history, botany, adventure, getting away from it all, seeing the rainforest and the outback, or 4 wheel driving then this is the trip for you. Getting there is half the fun with Adventure North Australia. Experience the Great Barrier Reef on board our luxury 30 metre sailing catamaran. Take in the excitement of big ship sailing combined with the ultimate in comfort. Let our crew pamper you in the luxurious air-conditioned lounge with its fully licensed bar, or soak up the sun under the sails. Crocodiles and cruising - this is Cairns! Tropical North Queensland's best attractions are at their best in this one package. Take a cruise up Trinity Inlet, then visit the crocodiles (or vice versa). You'll travel through sugar-cane fields, witness amazing waterbirds and the prehistoric crocs! Cruise To Green Island With Submarine & Lunch! A cruise to Green Island from Cairns is a beautiful day out. Include a submarine ride with that and lunch, and you've got the best day ever! This amazing cruise day is so relaxing and casual, it's a brilliant way to relax and unwind. These award-winning cruisers want to give you a dream day out. Take a Daintree Tour in comfort! This Daintree Full Day tour lets you explore the Daintree Rainforest's biggest attractions in affordable convenience. Picked up from your Port Douglas accommodation, this Daintree Tour visits Cape Tribulation and Mossman Gorge, AND includes a sumptuous picnic lunch! Walk in the footsteps of the world's oldest living culture featuring Kuku Yalanji Cultural Habitat Tours. This fun, exclusive tour allows you to join in a real Aboriginal cultural experience, combining pristine natural beauty and unusual wildlife. A day you will never forget!